Last night I went through my house like a mad woman searching under every piece of furniture, the pile of laundry, even the trash, looking for my beloved Betsey Johnson watch. I haven't been able to find it for a few days, but I knew it was in my house somewhere. Right when I gave up looking for it, and decided the cause was lost, I found it! Hallelujah! It was IN the couch. Not under it, but down under the cushion. Checking under the couch cushions was my final effort. Don't you hate when you lose something, but you know it's around your house somewhere? Anyway, since I started my blog this week, I thought I would share the process I went through to get it up and running, while it's still fresh in my mind. I knew I didn't want to spend a lot of money starting out with this, and I found ways to pinch a few pennies - I only spent about $40 to start this blog. I'm not an expert blogger, so keep in mind these are basic steps I used to get me started. Step 1: Choose a name/niche. I knew I wanted to blog about Paleo recipes, my dog, shopping, life, wine, etc., so I chose to go with more of a "lifestyle" blog, meaning I wouldn't be restrained in blogging about only one topic and fitting a specific niche. Then I narrowed down a name. Anything I thought of with my name in it was taken - lots of Julies out there. So I had to get creative. My family grows just about every vegetable and fruit that's possible to grow in Kentucky, and since I do take a more natural approach to food and products, I came up with the word "homegrown." A lot of names related to that keyword are taken as well. But it sort of just came to me to add "state of mind" to it. No one had claimed that name, and thus my blog got its name. So, make sure you choose a name that relates to you, and you should be good. Step 2: Buy a domain, but shop for coupons. When I first started looking at beginning a blog, 98 percent of other bloggers had posted that it's a good idea to go ahead and buy the domain, meaning my blog would be "myblog.com" instead of "myblog.blogspot.com" or "myblog.wordpress.com." I took the blogging world's advice and you should too. Just buy it. I chose GoDaddy.com and paid a miniscule amount for a year - about $9. Check out Retailmenot.com for coupons (I did), if price is a holdback. Step 3: Set up your platform. I chose Blogger. Here's why: It's free. 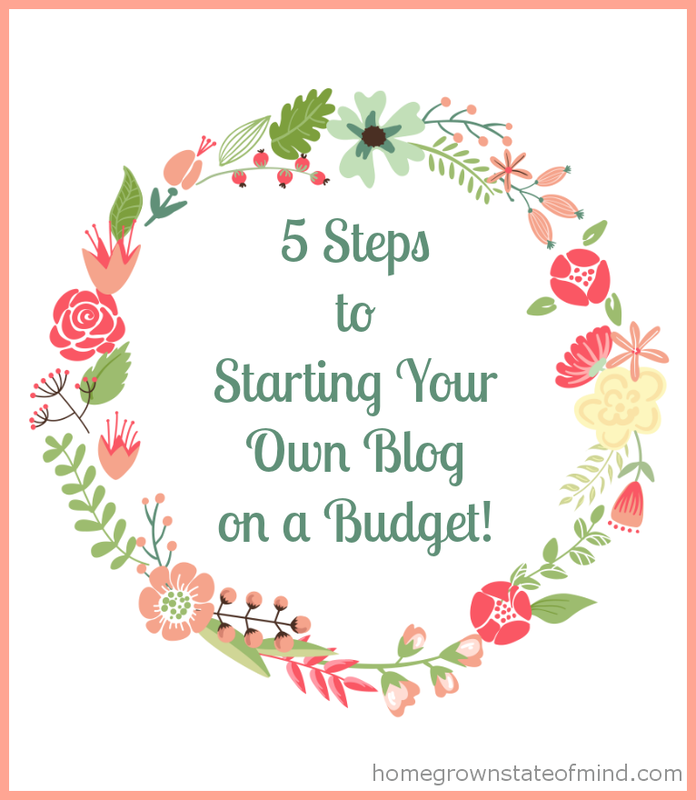 If you're on a budget, Blogger is the easiest way to go. Now as I researched this one, I found many diehard WordPress fans. Yes, it's free, is a great platform, and you can easily design a perfect blog with it, but it required a separate host (like BlueHost or DreamHost). Separate hosts require more moolah. Blogger doesn't require a separate host and is free. I went with free, for now, because this is more of a hobby for me. If you choose Blogger and want to upgrade to WordPress, you can always do that later. Here's a great comparison of Blogger and WordPress. Step 4: Set up social media. Once you've got your blog domain and platform/host setup, you'll need to start/rename the social media accounts you want to use with your blog. I chose Pinterest, Twitter and Bloglovin' for now, and renamed my existing accounts I had to include my blog name. This was an easy change in my account settings for all accounts. Starting from scratch with an account setup is very easy on most social media sites. You'll also want to add social media links to your blog, which brings me to Step 5. Step 5: Purchase a pre-made template and install it. Unless you are very familiar with html code, then save yourself the trouble and purchase a ready-to-install template. I have a little knowledge of code, but not enough to make everything on my blog the way I wanted it. I recommend Etsy. It's cheap, and there are lots of blog designs to chose from. I spent $30 on my template from the Blogaholic Designs Etsy shop, and installed it myself. I tweaked some things in the template and it was good to go. Most templates have social media icons automatically installed and you only have to add in your specific account URL to get set up. There are Etsy shops that will install the template for you for an additional fee ($5 to $10). You can always have someone design a custom template for you as well, but that can get pricey. For starting out, a budget-friendly template design can work. Here are some resources I used to adjust my template, all free. These ladies have excellent, easy-to-understand tutorials: Code it Pretty and XOMISSE. Now, start blogging! Blogging doesn't have to break the bank to get started. Sure, you can add on/change just about everything later on when you've got your foot in the door, and are willing to spend more money on it. But starting out doesn't have to wipeout your wallet. Did you design your own template for your blog, or did you buy it/have it custom made? 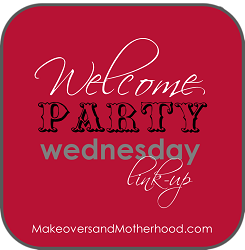 I'm linking up with Ducks 'n a Row for the Wonderful Wednesday Blog Hop, All She Cooks for the Wonderfully Creative Wednesdays link up and Makeovers and Motherhood for the Welcome Party Wednesday link up. Thank you for that post, Julie! I have been considering purchasing a domain-name -- but I'm little Miss Frugal. What are the benefits other than a shorter url?